Keep cozy with Alpha Kappa Psi's knit beanie. 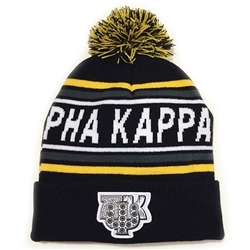 It features the fraternity's name as part of the woven design, the fraternity's historic jeweled badge as a patch on the brim and a pom pom for that classic beanie styling. Our one-size-fits-all cap is made with a 100% acrylic shell with double layer knit material and feature fold-over brims.